I left the classroom in 2007 after seven years as an elementary teacher to become a dean of students and athletic director at a junior high school. 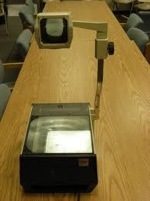 At that time, the overhead projector was the tool I used to display anything visual. SmartBoards were just starting to be installed. The only hands-on part about overheads was when a student had to run to the main office to get a replacement after the bulb burned out mid-lesson. In fact, that was one of my students’ classroom jobs. How technology has changed in such a short period of time is amazing. With all of these choices, it can be daunting to decide which device best supports the instructional needs in a teacher’s classroom. Focusing on reading aloud, I find the best technology to be the document camera. 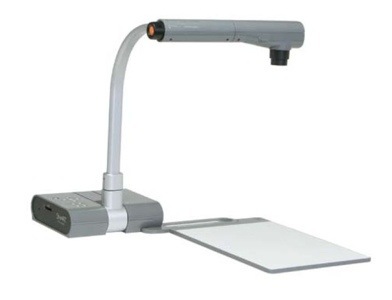 Used in concert with a voice amplification system, the document camera has taken this essential part of a balanced literacy program to a whole new level. 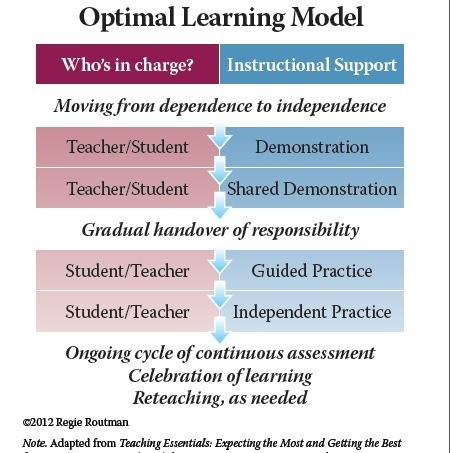 It is a key tool for teachers to model the learning process, an essential step in Regie Routman’s Optimal Learning Model and similar frameworks for instruction. While I am still trying to figure out where this technology tool belongs on the SAMR ladder, I have found that the document camera can augment read aloud time in the classroom. Rather than having different literature and separate times for reading aloud, for shared reading and for interactive reading alouds, a teacher could combine all of these practices into one activity. 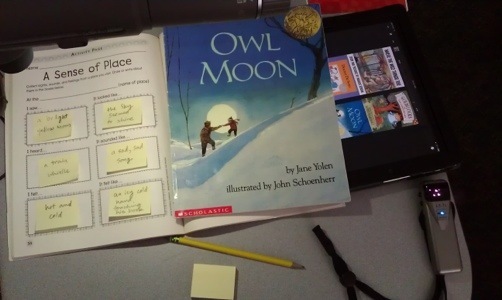 I often place the picture book or novel under the document camera so students can see the text as I read. Students can ask questions about text features as I read, even coming up to the book or SmartBoard to point out the specific item they wanted more information about. For example, a 2nd grader asked what the little symbols between paragraphs meant while reading aloud Tumtum and Nutmeg by Emily Bearn (to switch scenes during a chapter). These teachable moments can be documented by snapping a picture of the page to review later. I am referring to the books that you would love to share with students, but cannot because they do not work when just reading the text. A perfect example is Wonderstruck by Brian Selznick, a book I read aloud to 4th graders this school year. Prior to document cameras, I would have had to hold up this bulky book and display the pictures when the narrative transitioned from Ben’s story (told through text) to Rose’s story (told through illustrations). My arms hurt just thinking about having to do this. Instead, I was able to lay the book down and take my time as we perused the pictures. What’s even cooler is I can zoom in on certain parts of the illustration or text when we notice something important, which previously only a student reading alone could do. I have always tried to use a lot of reflective language while reading aloud and identify the spot in the story that caused me to think. Now with a document camera, the potential is there to make the thinking in my head while reading more concrete. For instance, I use Post-it notes while reading aloud books at the primary level to document my thinking. Before reading, I state my purpose for reading a book, whether just for pleasure or to gather information. Sometimes it is the same book read twice, once for each purpose (see: Mentor Texts). Owl Moon by Jane Yolen worked great at 1st grade. After reading it aloud to enjoy the story, I came back a second day to highlight some of the great descriptive language to help me with my own writing. After modeling this with Post-it notes, students raised their hands to share their picks for great examples of descriptive language in Jane Yolen’s book. I acknowledged their input by writing down their suggestions on a Post-it next to mine, for later reflection at the end. As a colleague of mine was apt to state, you could through a rock out in the hallway and hit someone with attention deficit disorder. While recognizing this as hyperbole, I would agree that many students lack the stamina and practice of listening to the written word spoken aloud. What the document camera does is give that visual in addition to the auditory. I don’t always use the document camera when reading aloud. In fact, most chapter books I read aloud at grades five and up are from a comfortable chair with zero technology. But when a book begs to be supplemented with a technology tool that enhances the read aloud experience and allows the student to better attend to its message, why not use it? The first one (white) has a much better camera and looks very portable. Haven’t used either, but I would spring for this one even with the extra $100.